Jean Terramorsi was a Renault vice-president in charge of small series production during the late 1970s. He conceived a brilliant way to take on the new generation mid-engined rally car while staying true to the French manufacturer's production models. He started with the Renault 5 supermini, turned the drivetrain around 180 degrees and mounted the now turbocharged engine where the rear seat of the production car would have been. 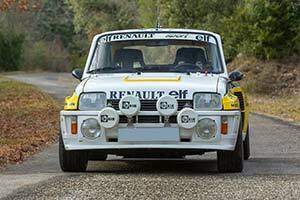 The result was dubbed the Renault 5 Turbo and first shown to the public at the 1978 Paris Auto Salon in concept form. Terramorsi never saw his vision become reality as he had passed away in 1976. It was, of course, not quite that straightforward as at least 400 examples of the new car had to be built to homologate the car for Group 4 competition use. However, by using many off the shelve components, the car could be made available for public sale at a relatively modest price while offering supercar like performance. While the production version of the Renault 5 Turbo was being readied, one of the prototypes, developed by Alpine, already saw action in the Group 5 class. Among the most notable results was a win in the Critérium des Cévennes, where a Lancia Stratos was beaten. In charge of the development of the car were engineers Francois Bernard and Bernard Tetu, who were also involved in the company's Formula 1 program. Although the new rally car was based on the Renault 5 monocoque, there was considerable room to fit a spectacular bodykit in order to clear the wider wheels. At the rear, these massive fender flares also served to provide the mid-mounted engine with fresh air. Based on a standard production unit, it featured a Garrett turbocharger and displaced just 1,397 cc. Taking the 1.4 equivalency factor into account, this meant the 5 Turbo could run in the under two-litre class.